The Sony Xperia Z was finally the proof we needed that the Japanese tech giant could in fact build a smartphone to truly rival the iPhone 5 and the Samsung Galaxy S4 and now it's setting its sights on the other end of the market with the Sony Xperia L.
Aimed at those whose bank balance can't stretch to the hulking great Z, but still want some of the features of the more expensive handset, we put the Xperia L to the test to find out if it's one of the best budget Android phones to buy. Essentially replacing the Sony Xperia J announced last year, the Xperia L takes design cues from the old-skool Sony Ericsson Xperia Arc with a matted curved back, which is an entirely different proposition in the hand compared with the glossy glass finish on the Xperia Z. Available in black, white and red shades, the L weighs in at 137g so it's only slightly lighter than the Z, but at 9.7mm thick it's not as slender, although it still feels like a slimline device to grip in the hand and to stow away in the pocket. The curved back can be clipped away from the main body, which hides away the removable battery and the microSD card but we'd suggest not whipping it apart too quickly as it doesn't feel the most durable parts of the design. Up front there's a sizeable bezel below the 4.3-inch display, which can actually feel quite sharp and uncomfortable if you tend to rest a finger below. Sony has kept the aluminium power key from the Xperia Z on the right edge of the device accompanied by a thin aluminium strip that goes all the way around the edges of the device. There's a plastic volume rocker and now a dedicated camera button so there's no need to do as much fiddling on screen. Up top is a 3.5mm headphone jack and on the left edge is the micro USB charging port minus those flimsy-looking latches on the Z. There's also a thin LED strip that flashes when you receive a notification. 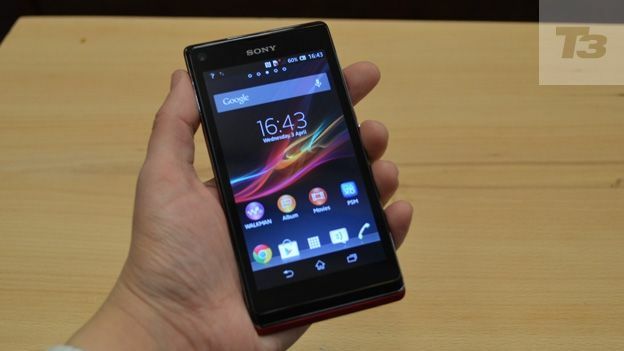 The Xperia L brandishes a 4.3-inch FWVGA display with an 854 x 480 resolution and 228 PPI, but is most notably lacking the Bravia Mobile Engine 2 tech that makes the Xperia Z such a rich and detailed place to watch video. Clarity levels are still impressive enough though when compared to similar Android offerings like the Samsung Galaxy S3 Mini even if it lacks the vibrancy of its bigger more expensive Xperia compatriot. In terms of putting the touchscreen to use for typing and browsing, we had a problematic experience particularly when using the virtual keyboard where we really had to force the issue to make sure the correct letters were displayed. We also found that scrolling and swiping around the homescreens and in Google Chrome often have to be repeated, which can be frustrating. It's also worth noting that while it may be a scratch-resistant display, it's still a haven for fingerprint smudges. The real star of the show here is the 8-megapixel rear-facing camera, which is housed inside of a raised silver ring to protect it from contact when it's lying on a table. There's also an Exmor RS sensor to deal with shots in low-lighting conditions, a 4x digital zoom with auto focus and HDR, which works for both video and still images. The results do not compete with the top-end handsets, but the L does deliver sharp, detailed stills with small traces of noise that mean you can definitely ditch the compact for basic snaps. Disappointingly, video recording is just 720p HD compared with the SP which is 1080p, while the 0.3-Megapixel VGA front-facing camera does not yield spectacular results for video chats. Shipping with Android 4.1 Jelly Bean, which you should be able to update to 4.2, Sony has skinned the look and feel of the Google operating system just as it has with the Xperia Z giving greater presence to its own services like the great WALKMAN app but also to more clunky offerings like the Sony Select application. Onboard Sony firmware clearly has an impact on the advertised 8GB of internal storage which is 5.8GB. However, there is microSD card support up to 32GB, which means it is covered to some extent but it does mean spending more money if you don't get one in the box. Wi-Fi and 3G connectivity aside, Sony has ensured that the L will play nice with a host of other devices with NFC, DLNA and Bluetooth 4.0 support all on board, which means you can transfer audio, pictures and video to compatible speakers and Sony TVs. Unsurprisingly, there's a dualcore 1GHz Qualcomm Snapdragon S4 processor with 1GB of RAM, which was more than capable of dealing with streaming video content and handling graphically a demanding game like Real Racing 3 with no noticeable signs of lag. In general use, applications can often take a little longer to launch both native and ones downloaded from Google Play, but operate smoothly once you are putting them to use. Hidden in the back is the removable 1,700mAh battery, which Sony claims should deliver around 8 hours of talk time and having used the handset extensively over a period of a day streaming content, playing games and simply browsing the web, it's true to its word. Like the Xperia Z, there are options to extend the battery life beyond that and the STAMINA mode, which cuts off mobile data while in standby does a great job of ensuring that it makes it through the day. The Sony Xperia L is no Xperia Z, but then it was never meant to be. What it tries to do is take as many of the great qualities from the flagship Sony phone and blend them into a cheaper, more affordable body and it does a generally decent job of it. The 8-Megapixel camera is a slick performer and the build is surprisingly quite good even if we are not entirely convinced by the sharp bezel. There are issues with the responsiveness of the touchscreen and some sluggishness operating simple tasks, so if you are really sold on buying a Sony smartphone that is not the Z we'd probably still opt for the Sony Xperia SP (as a more suitable smartphone partner.